Second generation biofuels may be produced by different processes, using a variety of feedstocks. Consequently, a gasification reactor used for biofuel production must handle biomass mixtures with various physical properties. The need for advanced biofuels is emphasised at both national and international level. Biofuel can be produced from sustainable sources as wood and waste from forestry, agriculture, industry and household. It is important to develop an energy effective process that addresses the challenges associated with the conversion of biomass into biofuel. Gasification is the first step in the production of biofuels from biomass. 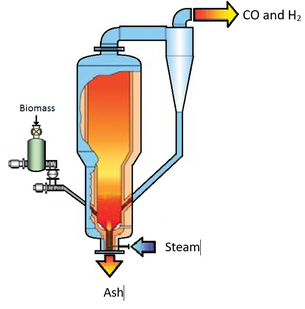 In this step, the biomass is heated and converted into a synthesis gas consisting of carbon monoxide (CO) and hydrogen (H2). 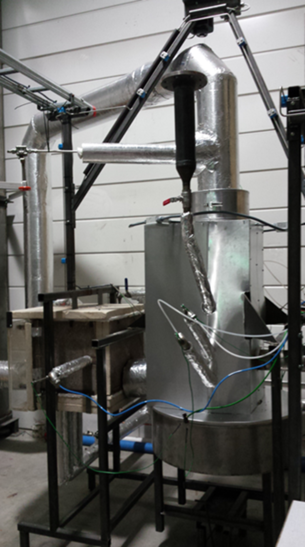 The quality of the synthesis gas very much depends on the type of biomass and the operating temperature. The gasifier is typically running at 800-900 °C; a high temperature gives a high concentration of CO and H2 in the product gas, but a high temperature can also result in problems with ash melting in the reactor. In the biomass to biofuel process, it is crucial that the quality of the synthesis gas from the gasification meets the requirements for the downstream processing. Bio4Fuels is a Centre for Environment Friendly Energy Research (FME), an initiative between over 40 Stakeholders and the research partners: NTNU, PFI, NIBIO, USN, IFE, with NMBU as host institute and SINTEF as Centre leader. The main objective for Bio4Fuels is to develop innovative technology and support industries to realize economic and sustainable conversion of biomass to transportation fuels along with added value chemicals, particularly from lignocellulosic biomass and organic residues. USN contributes in the Bio4Fuels FME by studying and preparing for piloting and scaling of conversion processes for biomass to biofuel. Particularly biomass from lignocellulosic and organic residues are used. Technologies studied in other work packages in Bio4Fuels and in other projects are used to make the framework for the simulation models. The simulation tools are computational fluid dynamics software (Ansys/Fluent and Barracuda) and process simulation software (Aspen Hysys or Aspen Plus). This gives a framework for process design analysis and optimization. Development of process models is needed to select appropriate process combinations from a wide range of options. The models can be used in the development of business cases for industrial implementation and will generate insight into the framework needed for successful commercialization and piloting of the most promising technologies for production of biofuels from biomass. “Predicting the FLow behavior of ASH mixtures for production of transport biofuels in the circular economy” (FLASH) is and EnergiX project. The project partners are USN, SINTEF Energy Research, BOKU and Aalto University. The project is funded by 9.9 MNOK from the Norwegian Research Council.